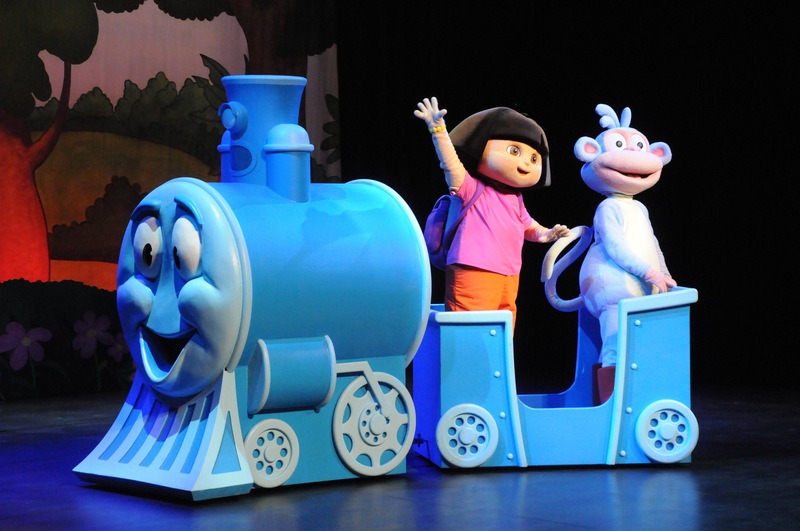 Some of you may remember I previously posted about being excited to go and see the Dora the Explorer Live tour – Search for the City of Lost Toys. Well, we went on Saturday and the boys were definitely very excited. We drove over to Milton Keynes to see the show in Milton Keynes Theatre. Unfortunately because of an accident on the M1 causing a lot of delays we ended up getting a little bit late and missed the very beginning, which is such a shame as we had been looking forward to it so much but the theatre staff were very understanding and helpful and they sneaked us in even though it had started. It was easy to catch up with the story straight away and as the children are familiar with all the characters from watching Dora on TV, this wasn’t too much of a problem. The story is all about Dora and Boots finding the way to the City of Lost Toys for Dora to be reunited with her Teddy Bear. They use the map to help guide them along the way, which any child who watches on the TV will be familiar with. 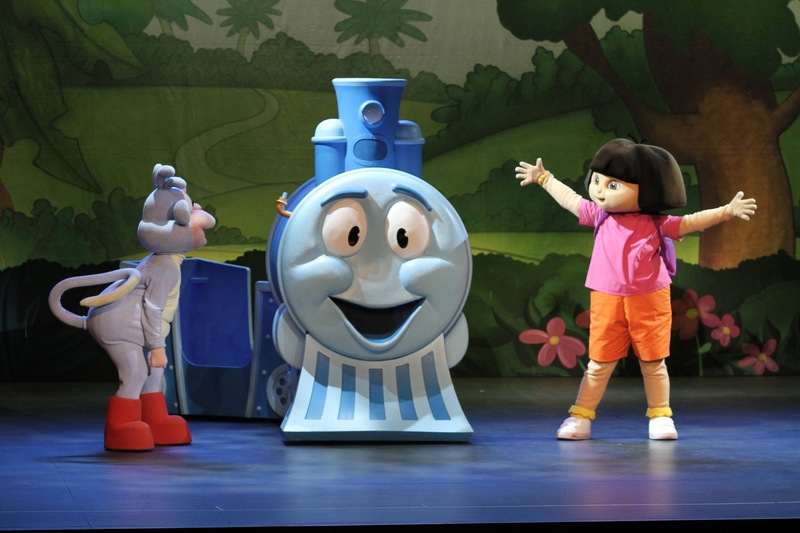 Elements like the talking map, and Dora’s back pack have been incorporated in a way which is really true to the original show. The show includes lots of great songs, with lovely effects like stars glittering and shining on the stage background and projected all over the audience too, or bubbles being blown out into the audience. This added a more interactive element for the children and I found that really good. The songs are well sung and have catchy tunes, so even as an adult I still enjoyed it. Dora and Boot’s journey takes them through various destinations like the Number Pyramid and the Jungle before they finally cross the water and arrive at the City of Lost Toys. My 5 year old especially loved the number pyramid bit. He is a bit of a maths and numbers enthusiast so he was really happy to see this included. Dora and Boots shouted out questions to the audience to get the children involved and included. These were maths questions and sums which they would need the answer to in order to progress further in their journey. The level of these is quite easy and younger children would manage them fine too. It includes questions like thinking bout what is greater than 4 but less than 6. Numbers in Spanish are also incorporated, and a few number jokes. Dora’s cousin Diego makes an appearance when they get to the Jungle (actually a rain forest). Again there is some interactive sections for the children to help with. This is by calling out answers to fix the mixed up jungle. This section included a lot of animals and animal noises, as they all search for Baby Jaguar in the jungle. There are also some appearances from the sneaky Swiper, of course! My children found this funny to see. Luckily Dora does beat Swiper to the toys and manages to reunite with her tedddy, and not let Swiper swipe any of the toys. My 5 and 3 years old sat totally still and just watched the whole thing totally engaged. The show is 1 hour with an interval in between, so two 30 minute sections. This is quite manageable for young children and all of the children in the audience seemed to be fine with it! My youngest was a little more wriggly, being just under two years (at the time – he has just turned two now!) He definitely enjoyed the show though and he loved seeing the bubbles coming out during the final song. This is the first live show he has seen as a toddler and I think it was a perfect first show to introduce him to this kind of thing, as it was not too long to sit through and it is so interactive and lively to keep him engaged. The whole production is extremely well done,with the costumes being so realistic to the characters, and the stage, effects and songs are all clearly done with a lot of care and attention. I am sure any young Dora fans would enjoy it and It makes a lovely relaxing family outing. The show has already been seen by over 2 million people worldwide! For more details on the show, click here. If any of you have been too, let me know what you thought in the comments! My kids love watching too! It is great! Looks like a fab show! dora look like so much fun !! !